The receptors are of five main types. These are mechanoreceptors, photoreceptors, chemoreceptors, electroreceptors and thermoreceptors. Chemical receptors are of two types :taste bud for taste and Olfactory cells for smell. Taste receptors(Gustatoreceptors): The receptor cells for taste (gustation) occur in groups called taste buds. The taste buds mostly lie in the mucous membrane that lines the grooves around the papillae on the tongue. A papilla may contain a few to about a hundred taste buds, and there are about 10000 taste buds on the entire tongue. Some taste buds also occur in the mucous membrane of the pharynx, palate and epiglottis. Another name for taste buds is gustatory sensillum. Olfactoreceptors (Smell receptors): Olfactory sensation is the most primitive of all special senses and is much more acute than taste. The receptors for smell occur in small patch of olfactory neuroepithelium, located in the roof of the nasal cavity. Occur in taste buds on tongue, palate, epiglottis, and pharyngeal wall. Occur in a small patch of olfactory epithelium lining the roof of nasal cavity. Smell as well as taste the food. Are bipolar neurons (primary sense cells). Are spindle shaped in form. Free ends taper and bear microvilli which have receptor sites for taste producing molecules. Free ends of dendrites enlarge into vesicles that bear non motile cilia carrying receptor sites for odoriferous substances. Sensory nerve fibres form synapses on the surface of taste cells. 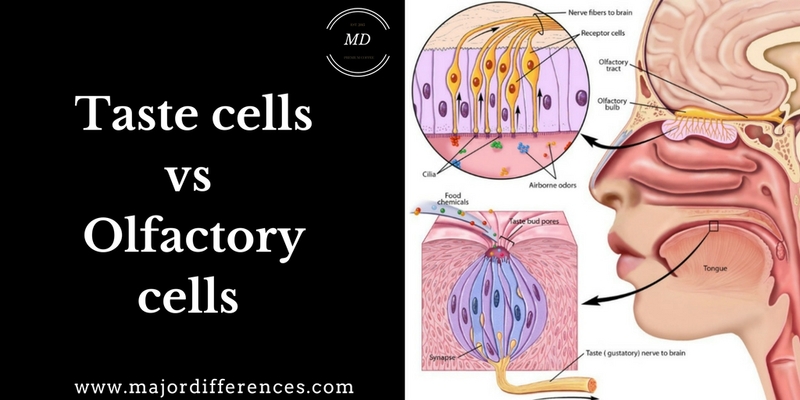 Axons of olfactory cells act as sensory fibres. Taste cells function only as sensory receptors. Olfactory cells function as sensory receptors as well as conducting neurons. Are stimulated by chemicals that come in their contact in relatively high concentrations. Are stimulated by chemicals from a distance and in much lower concentrations.